Marvellous my Anzula yarn doubled will match the gauge required for a vest top I like the look of. We always fall in love with yarn and then struggle to find a pattern we like. I've been looking for patterns for the Anzula yarn since November (well sort of on and off being interrupted by other yarn projects with more pressing deadlines.) The rule of thumb is times the gauge by 0.7 so 30 stitches per 4 inches becomes 21 stitches per 4 inches. 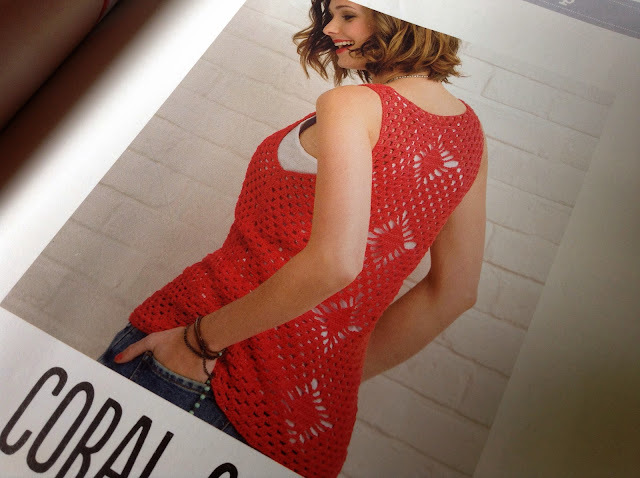 The pattern is in Simply Crochet issue 22 Diamond Vest Top but I will crochet it in the round rather than front then back because I dislike seams.